Summer is here and the temperature are high. Here are a few recipes to help keep you cool. When you are working out in the warmer months you tend to sweat more, making it necessary to replace both electrolytes and fluids fluids. Commercial sports drinks have a lot of sugar in them, and buying the plastic bottles is wasteful so here is an alternative that you can make easily at home, and put in your own h20 bottle. Mix all the ingredients together (heat the water and honey to melt if you like) and store in the fridge. Add ice cubes before workout so that your drink is cool. Double or triple the recipe if you want to have extra on hand. 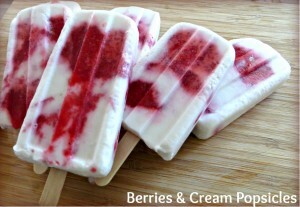 Here are a few frozen treats that use lots of fruits so they are nutritious, delicious and refreshing. ENJOY! Blueberries are one the ‘super foods’ , and readily available right now since they are in season locally. Delicious! I’ve never met a mango I didn’t like – and mixed together with greek yogurt and then frozen – fabulous! This one is yummy and creamy but uses coconut milk instead of dairy as a nice alternative.